The Lotus 11 has one of the most elegant of body shapes. A Frank Costin creation it truly looks as aerodynamic as any car could ever be, though it never saw a wind tunnel. Colin Chapman's inspiration for the 1956 season, the Eleven was a serious case of form following function. A tubular space frame chassis with De Dion rear axle and Girling disc brakes, the standard version, called the Le Mans, boasted a 1500 cc Climax engine. The car weighed only about 1,000 lb, fully loaded. Other Versions were the club, for 1100cc racing featuring a Climax engine, and the Sport, for 1200cc racing utilising a Ford engine; both featured a live rear axle and drum brakes. Of all the lotus 11s that were built one has a particularly captivating history. 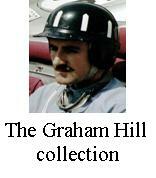 Graham Hill's car, "Yellow Peril", chassis no’ 208, reg’ no. XJH 902, has a prime place in motorsport history. Built by the legendary Graham Hill, over April/May 1956 while he was working as a mechanic at Lotus, it was part of a deal between Hill and Chapman that allowed Hill to buy his own car and go racing and meant Chapman to keep a talented engineer at Lotus. Chapman felt Hill was of more value to Lotus as an engineer than as a race driver and although Hill had shown a good turn of speed in races Chapman wouldn’t put him on the works team. Hill was threatening to leave and join a competitors driving staff, Chapman did not want to loose Hill and he didn’t want lotus’ secrets going elsewhere either (one of the secrets being Lotus were short of cash and couldn’t pay Hill the extra drivers rates!). So the deal was advantageous to both parties. Hill raced in the 1200cc class of the Autosport Production Car Championship, his own car going down as a works entry, so Chapman part funded the car too. He also drove other works 11s when required through ‘56 and ‘57. To save money Hill would drive it to race meetings, compete, then drive it home. A practice not uncommon in motor racing circles and a bonus of the car being road legal. Hill gave his Lotus 11 its first race on 9 June 1956 at Oulton Park. He raced it at a further eight meetings that season and, displaying the skills that would eventually make him a double world champion, finished on the podium in all nine races, winning four times. Lotus displayed the car at the British Motor Show in October 1956 and used it as demonstrator for the Guild of Motoring Writers test day at Goodwood in the next month. The road test reports appeared in Autosport on 23/1/57 and Motor Sport in February 1957. This model came to light on a shovel in Ian's back garden...... literally! During some garden work he dug it up, it was in a pretty poor state but Lotus 11 model kits being very rare, and Merit's offering also being rather expensive, it was too good an opertunity to throw away. After who knows how long under ground the metal of the body was very pitted and the paint was almost all gone, none of the glass work remained. Fortunately the tyres and wheels were still good enough to reclaim. The first job was seperate the parts of the car and then sand the body and clean all the paint off. Once this was done the metal was given a rust treatment coating, although the metal in use was not steel it seemed wise to protect the metal and give a good stable base to work from. Next came filling of all the pitting and holes with Isopon38 followed by lots of sanding. Slowly the body began to resume its original shape and once Ian was happy with the smoothness of the body surface A coat of Halfords filler primer was applied and then sanded back. Standard Halfords primer could then be used and top coats of Halfords Broom yellow were built up. Finally T-cut and polish could bring up the surface finish to a standard at least as good as when the model was brand new. Photo etch shapes from a generic set helped replace the details such as badges and lights. New glazing was made from clear acetate sheet, the light cluster covers were fairly straight forward but the Windscreen required a lot of shaping and careful bending to get it to fit snuggly. A tonneau cover was made from masking tape painted with Citadel acrylic paints. Bare metal foil was applied to the side panels, fuel filler cap and door levers, while small dots of silver paint replicate the press stud clips for the tonneau covers. Decals were sourced from the spares box.